After Wendy Ellis placed orders for milestone stickers on Etsy.com for five different friends who had just delivered babies, she became inspired to start making her own. Ellis’ background is in marketing, working with graphic designers and professional printers for a firm in Chicago, so she was familiar with the creative and production processes. Penny and Prince, named for beloved childhood dachshunds, sells on-trend, designer pregnancy, baby and puppy (!) stickers in various monthly, holiday and milestone designs, many gender neutral and some in Spanish, for those sweet milestone pictures seen all over your social media streams. They’re so adorable, they almost make me want to have another child … but not quite. The high-quality stickers are thoughtfully designed, printed locally and are perfectly packaged to give as baby shower or holiday gifts. Ellis loves to receive pictures from customers of her stickers in the wild and is working on compiling them into a gallery on the website, of babies, animals and a random adult here and there (some have gotten creative with a permanent marker and added a few digits to the months for a funny grown-up gag gift). Ellis also says the 12 pictures of baby’s first year make for charming decorative banners that could be hung in the child’s room or brought out annually for birthday parties. Penny and Prince stickers are available for purchase online via Amazon, Etsy and Zulily. To see the full range of current designs, and to keep tabs on new options, visit www.PennyandPrince.com. Conceived by Jacob Sauer, art director at One Lucky Guitar, Boxlanders is a small, local startup that designs cardboard play boxes for kids. Think refrigerator box but way cooler, more durable and more conveniently stored when not in use. Littles can customize the boxes by coloring in with markers and crayons, adorning with stickers, paper streamers and more. The first offered design is The Fortress, a regal castle with a working door and two small side windows, fit for a pint-sized prince or princess. After playtime is over, the 30-inch wide by 40-inch tall box folds flat and can be stored under a bed or in a closet. While the age range is flexible (I mean, I had fun playing with my sons’ Fortress), Sauer says 3- to 5-year-olds are his general target audience, not 38, despite my enjoyment. The play sets are produced by another local company, Kelly Box, so supporting Boxlanders doubly supports Fort Wayne area ventures. Boxlanders can be purchased at various markets and pop-ups around town and retail for $30. Follow @Boxlanders on Instagram and Facebook for tips on where to buy for the holidays, as The Fortress will make an excellent gift for the imaginative kids in your world. If you’re in the mood for a little road trip, cruise down to Berne to shop the adorable downtown. You’ll find antiques and home goods, clothing and comfort food in this charming Swiss village. 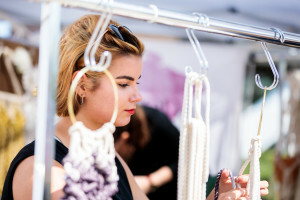 Among the locally owned, indie shops is Honeysuckle, a delightful space full of well-edited vintage goods as well as lovely modern designs. 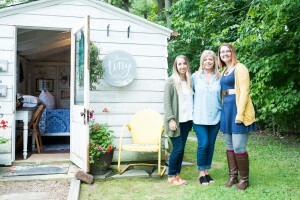 Owner (also graphic designer and blogger) Shelby Goodman started out on Etsy in 2011 but after moving with her husband and children to Berne from Lynchburg, Virginia, to be closer to family, she decided to add a brick and mortar space to her online venture, opening the doors in Berne in April 2016. Honeysuckle stocks carefully selected, cool vintage accents and furniture in excellent condition, many of the pieces from the oh-so-popular mid-century modern era, which is what compelled me to finally make the drive to the storied town. I came away with a trio of authentic MCM gulls to hang on the wall of my atomic ranch. Goodman said her passion “is the unique home that tells a story. I love helping others create a home that feels special to them.” The shop is open on Fridays from 3 p.m. to 6 p.m. and is located at 155 Sprunger St. in Berne. To learn more, call (260) 225-8226 or visit www.etsy.com/shop/thehoneysuckleshop.